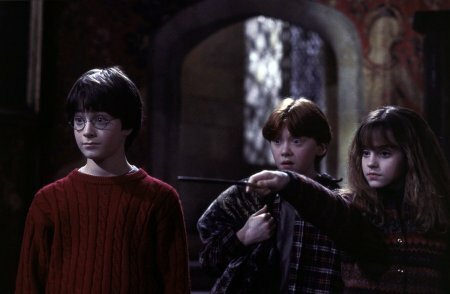 People who have seen and will see Harry Potter and the Sorcerer's Stone can be easily divided into two camps: those who have read the book, and those who haven't. As for me, I did indeed read the book first, although it was a couple of years ago. Thus I must concede, as is always the case, that the book is once again better than the movie. However, this time around the movie, as is not always the case, really does the book justice. And J. K. Rowling, the author behind Harry Potter, wouldn't have had it any other way. In fact, I've read that Rowling insisted upon director Chris Columbus (not the one who sailed the ocean blue, but writer of Gremlins and Goonies, and director of Home Alone and Mrs. Doubtfire) that he do two things. First, the script and movie must stay true to the book's plot and essence. And second, he must use an all-British cast. Luckily for Columbus, there is a plethora of talent in Great Britain from which to draw. And this is where I think the movie version of Harry Potter really scored big...the cast. Having read the book, it was simply amazing and very rewarding to see these characters come to life on the big screen. Some came with familiar faces, while others appeared with faces that we have never seen before. But all of them were readily familiar to me, as the visions and expectations that I had for each of them were all at once realized before me. I was instantly impressed with Maggie Smith as Professor McGonagall, who had all of the manner of a strict disciplinarian along with flashes of kindness and approval. 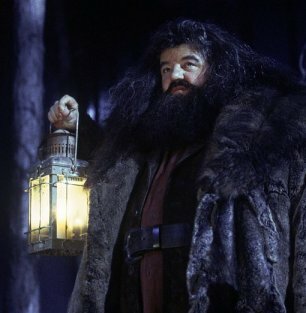 And Robbie Coltrane as the gamekeeper, Hagrid, could not have done better. I instantly knew him, the moment I saw him (he is pictured below - left). I was particularly impressed with Hermione, played by newcomer Emma Watson (II) who is certain to be a big star. However, stealing the show were two very talented and notable actors. The first is Alan Rickman, whose evil-looking visage we have all hated in such blockbusters as Die Hard and Robin Hood: Prince of Thieves (he was Sheriff Nottingham in the latter). 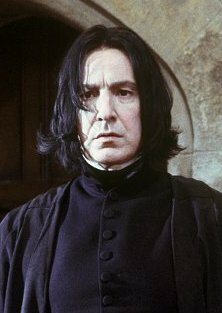 As Professor Snape (above, right), he brings all of the eeriness and spookiness that his character demands. And last, but certainly not least, no one, and I do mean no one, could have even attempted to become Headmaster Albus Dumbledore, but Richard Harris (who most recently appeared as Emperor Marcus Aurelius in Gladiator). Harris was fantastic! Aside from the cast, there are several other things which the movie version also does well. First and foremost is the visual appearance of the film. I think they again hit the mark just right. The visual aspects of the film are most greatly exemplified and enhanced by the wonderful costumes used in this movie. Makeup was also a key factor and was very well done, especially with the bank tellers (you hard-core Potter fans will have to forgive me, for I do forget their names!). On the down side, I was only partially impressed with the special effects. The Hogwart's school looked to me like the artists rendering that it was. 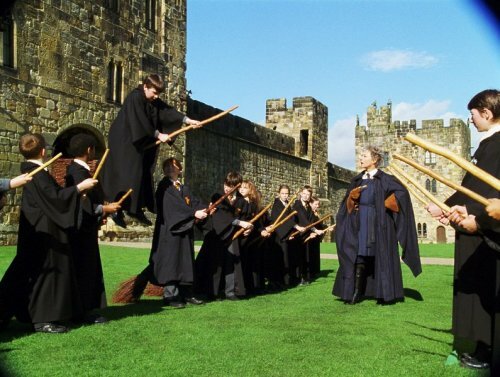 And the Quidditch match, though very much fun to see, was just too fast and busy...to the point that it almost made me sick trying to watch and keep up with its jittery movement. I was also somewhat displeased with the musical score. It just didn't do much for me emotionally and was at times even annoyingly distracting. And, as I alluded to earlier, the book does always seem to outdo the movie in many respects. In this case, it mainly has to do with explanations. Those of us who have read the book were the recipients of a wealth of background information, vivid descriptions, and helpful explanations which the movie simply did not offer. Thus, I would suspect that those who have not yet read this wonderful book to come away from this movie with many unanswered questions. In addition, since time is usually a very constraining factor with movies, there were a few scenes which appeared in the book but which did not appear in the movie. For example, I believe that there were a couple more spells or traps which Harry Potter and his friends had to weave their way through to get to the magic mirror. Also, I believe that there was another confrontation between Harry Potter and Professor Snape toward the end of the story which did not occur in the film. 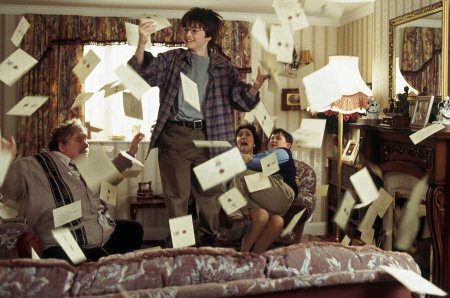 However, in the final analysis, Harry Potter and the Sorcerer's Stone (the movie) can stand on its own as an intriguing, wildly entertaining, and heart-warming film. It is a sad shame that there are those unfortunate few who have decried and bemoaned this film, claiming (without ever reading or viewing it, to be sure) that the story promotes witchcraft and satanism. And they are few because this movie has broken just about every record for film releases. And they are so dead wrong in their viewpoint. This movie does not have anything to do with religion, alternate or otherwise. In fact, the entire Hogwart's School of Witchcraft and Wizardry observes and celebrates Christmas. And the moral lessons and values that this story teaches all of us are even more plentiful as a Sunday morning sermon. This movie is about a boy who, though suffering his entire life from neglect and persecution, is able to discover that he is special. And this boy teaches us all that courage, kindness, and the lack of greed are able to overcome any enemy, no matter how evil and powerful. and an evil wizard whose head is on the back side of another man's head. My 6-year-old was OK with the first three, but did not particularly enjoy the final example given. However, all in all, she really enjoyed the movie and is anxious to see the rest of the series. As for the Harry Potter series, get ready for a bunch of them...a septet to be exact. That's right. J. K. Rowling plans to finish with seven of these under her belt, to all of which the movie rights have already been purchased. Well, you have probably already seen it, so I hope you liked it. If not, be sure not to miss this instant classic. 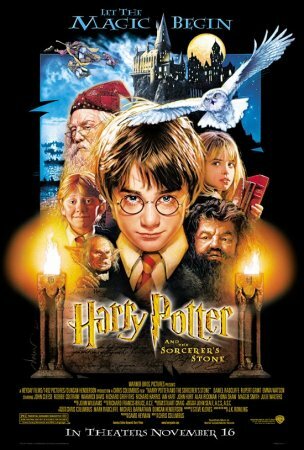 How would you rate the movie Harry Potter and the Sorcerer's Stone? There have been 62855 people to visit this page since Mon, Dec 3, 2001. And you are the first person to visit this page today!